1) A new operating system. Wellbeing Teams have been described as a new operating system for social care, with a suite of apps to match. Instead of doing just one thing – like an old-fashioned landline – they can build on their core foundations to adapt to the needs of the local area. 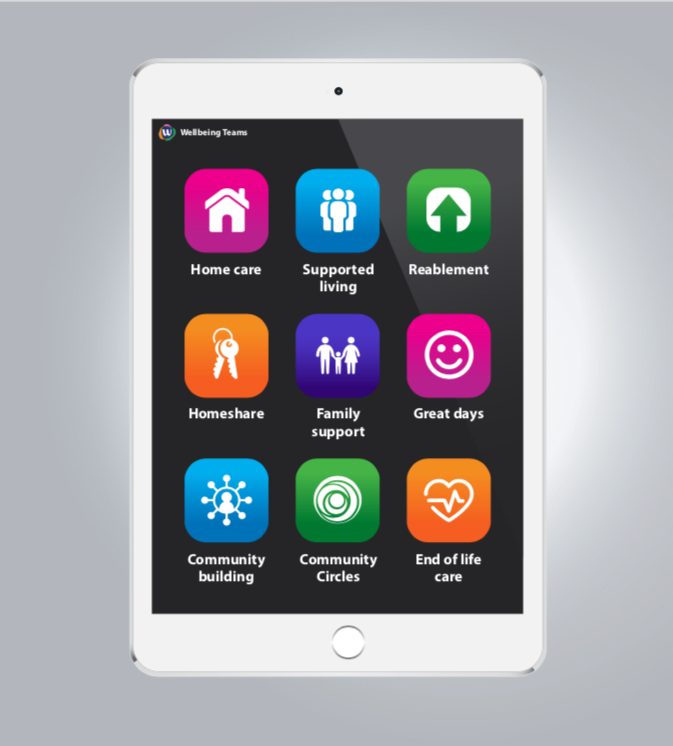 For example, one team started by installing the ‘home care app’, but when they heard that over 40 day centres had recently closed locally they decided to install a second app – ’Great Days’. Another team started by supporting people with learning disabilities, but then found that they were also asked to support older people to have great days too. Other potential apps that are being discussed with commissioners and communities are around end of life/hospice at home, reablement, supporting recovery in mental health and supporting people with learning disabilities to set up microenterprises. Each app brings its own specialist functionality, but always within the Wellbeing Teams operating system. 2) Self-management. Wellbeing Teams don’t have a traditional manager. Instead they are supported to make decisions and resolve challenges themselves, by a Wellbeing Leader. The roles that the manager would have taken – from scheduling, to recruitment, to marketing and communications (which we call storytelling) – are shared by team members, based on their strengths. Working in this way keeps day-to-day decisions closer to the people we support, keeping us lean and agile. 3) Value Based Recruitment – recuiting from outside social care. We won Best Recruitment Initiative with Skills for Care in 2018 for the innovative ways we’ve been introducing to recruit people for values rather than what’s written on their CV; and we do it all without an HR department. Social care is struggling to find the people it needs to keep the sector going, which is part of the reason why we intentionally recruit from outside social care and ensure that we appeal to different generations. 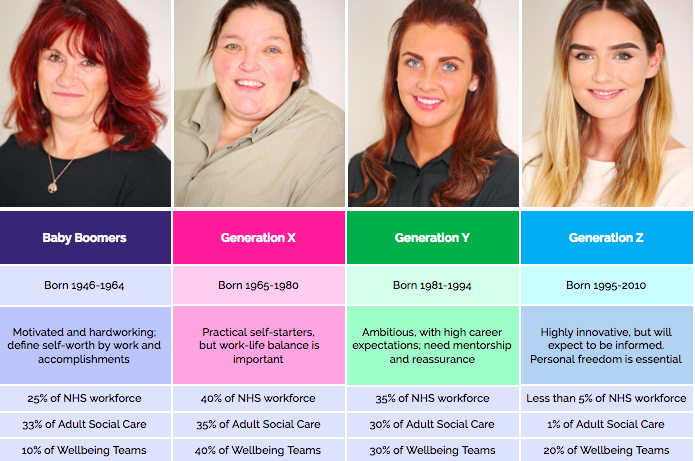 Over 85% of the people we recruit do not currently work in health or care. 4) Community focus. Boredom and loneliness have both been shown to have a severe impact upon people’s health and wellbeing, so we actively support people to be part of their community in a number of ways. Each Wellbeing Team supported by a Community Circles Connector; whose role is to support people to be part of their community through helping them to connect to what is already happening, building on ideas from social prescribing, or if nothing is locally available, create new opportunities to do more of what matters to them. Recently we’ve started a community knitting group, and we’ve got plans for much more on the horizon. 5) Support for Wellbeing. We help both the people we support and our team to focus on their wellbeing, in a holistic sense. For people we support, we look together at what is working and not working in their life, help them to define what their personal priorities are, and co-design ideas for how to deliver these alongside their statutory commissioned outcomes. This means that instead of just helping someone with the day-to-day basics, we’re better-placed to help them live a life that reflects what matters to them too. For our team, we invest in different ways to embed the ‘Five Ways to Wellbeing’, as well as getting data on how well the team is doing month-to-month using the colleague engagement tool Peakon. We’re also setting up Action for Happiness courses for our team, for the people we support and for the wider community. Read about feedback from our team here. 6) Technology. We believe that technology is an underused asset that can achieve transformational change in the sector, and we’re committed to making that happen. All care and support plans are securely located on a secure app, and every Wellbeing Worker is given a smartphone in order to be able to access them. This means that all Wellbeing Workers have automatic access to the most up-to-date version of the care and support plans, and we can also integrate photos and videos to show how people like things to be done. Additionally, in the spirit of transparency and great communication, families can be authorised to have the app on their phone and keep up-to-date with their loved one’s care. Where it can support people’s desired outcomes, we give them to explore new technology too. 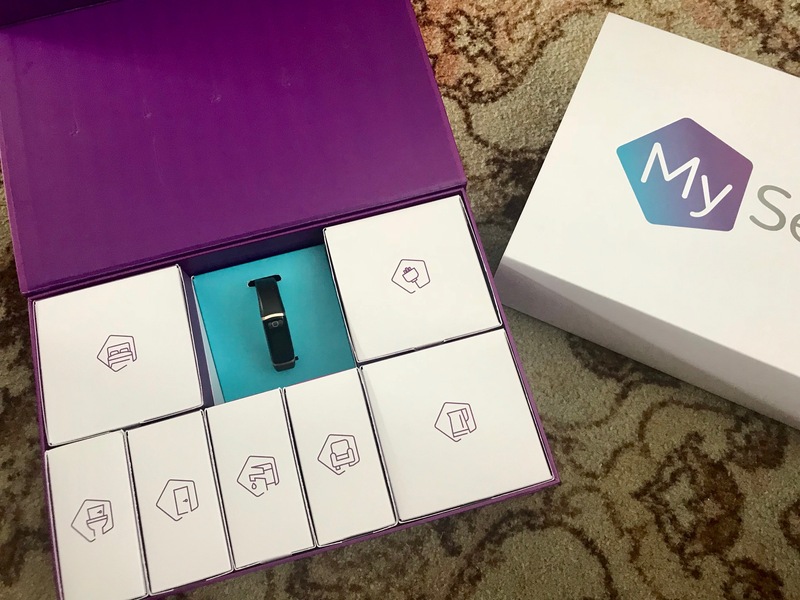 Examples include Amazon Echo, wearable health and fitness trackers and even a robotic cat! In terms of communication, families who live away can join in a review via Skype, and our team keep in touch through apps such as Slack and Loomio. We are experimenting with VR for pain relief, and now have a strategic partnership with My Sense. 7) Co-production. 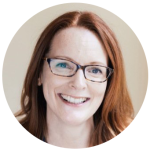 We are passionate about co-producing Wellbeing Teams with people, and our I work closely with my Co-production Partner Helen Ratcliffe. Helen is part of our recruitment team, often attending recruitment workshops. She participates in opportunities to generate and test new ideas, and also acts as a mentor. 8) Collaboration. A radical approach to building strong partnerships is key to us achieving our purpose. We are very grateful to Making Space who are our major support in developing the first Wellbeing Teams in Wigan. We also work closely with partners at local authorities across the country to think bigger about whole system change, including thinking more widely about effective approaches to Individual Service Funds, how we might support wider community involvement, or even how we might support local women to discover great work in the care sector. 9) Transparency. Our purpose is to do whatever it takes to support people to live well at home and be part of their community. 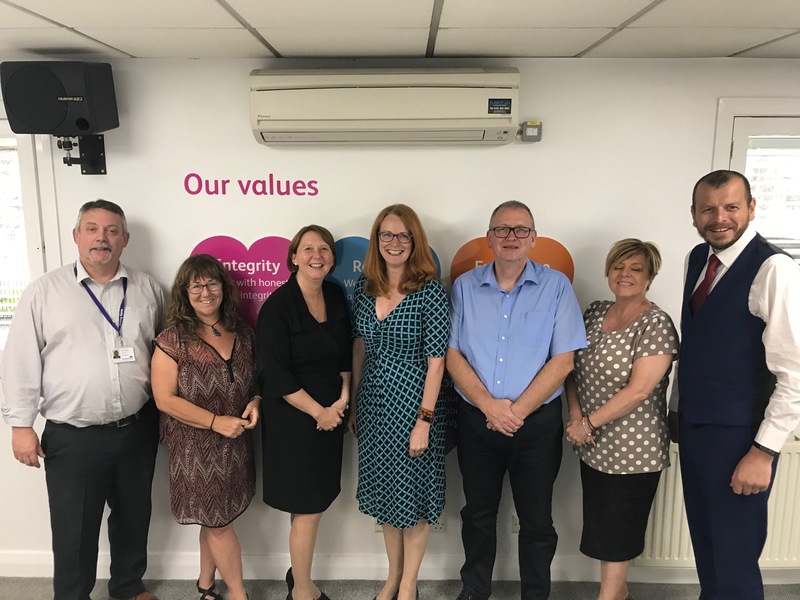 We do this by delivering different care and support, but we are also committed to sharing the way we work openly – in a spirit of collaboration – so others can learn from how we work too. Next month we are launching Open Teams. This will act as an open source hub for learning all about Wellbeing Teams. It will contain our internal processes and procedures (detailed in our ‘Handbooks’) as well as videos and other resources we share with our teams. Not only can people read them and learn from them, they can also comment on them so we can learn and improve too. Alongside Open Teams, I have been doing weekly short video blogs since September 2017 on here LinkedIn; to share our progress, learning and challenges. 10) Focus on relationships. Whether it’s with the people we support, amongst our team, or within the wider community; people are at the heart of everything we do, and Wellbeing Teams relies on flourishing relationships. We have a range of ways in which we actively encourage and support teams to bring their whole selves to work and form close relationships with their buddy and team, starting from the very first chat we have with them, through recruitment workshops, inductions and ongoing support. Recently a team member told us, “I feel totally connected with the team and supported. I have never felt like this in a workplace before.” We actively work to build close relationships with people we support, far beyond just taking care of their day-to-day needs. Infact – we go as far as talking about love. We do this through person-centred conversations and compassionate communication techniques, as well as by developing life histories with each person we support, which they can choose to record in a book to keep at home. We are very grateful for the support we have received to get this far. We are expanding, and currently recruiting in Wigan, Oxford and Thurrock. We are also half way through our second Future Leaders course, for people who want to see if they are Wellbeing Leaders of the future. If you wanted to do something radical – have a look at our website and see if Future Leaders could be for you. You can stay in your current role, and then join us when the time is right.